Purpose: The system will confirm the identity of people visiting the United States, note when they have overstayed their visas and alert the government if people have been identified as security risks. While security is its top priority, the system also will ease the flow of legitimate trade and travel. It will do this by integrating several data sources, including biographical information, biometric data and watch lists. Accenture also will work to improve systems interoperability, integrate commercial technology and enhance information sharing and coordination with other government agencies. U.S. Visit also will support efforts to "extend the border" by collecting and processing biometric information from people applying for visas at U.S. consular offices around the world. Source: DHS, Federal Sources Inc.
Jan. 5: The U.S. Visit program began scanning both index fingers and taking digital photos of most foreign visitors traveling with non-immigrant visas at 115 airports and 14 cruise ship terminals in the United States. Sept. 30: The program will expand to include visitors traveling under the Visa Waiver Program at all U.S. air and sea ports of entry. Dec. 31: U.S. Visit procedures will expand to include the 50 busiest land ports of entry. Dec. 31, 2005: U.S. Visit will expand to all 165 land ports of entry. Oct. 26, 2006: DHS will seek a two-year extension of an Oct. 26, 2004, deadline that requires countries in the Visa Waiver Program to issue passports with machine-readable biometric identifiers. DHS wants this as a new deadline to give countries more time to comply. DHS launched U.S Visit at Dulles International Airport in Virginia in January. It might not be as stunning an upset as Buster Douglas knocking out Mike Tyson for the heavyweight championship in 1990, but Accenture Ltd.'s selection as prime contractor for the U.S. Visit program surprised many market experts. Although Accenture is well known in the government market, few expected the company to prevail against Lockheed Martin Corp. and Computer Sciences Corp., the No. 1 and No. 3 prime contractors, respectively, last year in the federal IT market. "They came out of nowhere to win," said Thomas Meagher, an analyst who covers the government market for BB&T Capital Markets Inc. of Richmond, Va.
Officials with the Hamilton, Bermuda, company expressed little surprise that they captured the multibillion-dollar, 10-year U.S. 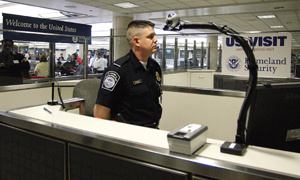 Visitor and Immigration Status Indication Technology system, known as U.S. Visit, beating teams led by Lockheed Martin of Bethesda, Md., and CSC of El Segundo, Calif. The contract has a $10 billion ceiling but is not expected to reach that level, according to Homeland Security Department officials. The contract was awarded May 28 and publicly announced June 1. Accenture's task now is to build a system that tracks when non-citizens apply for visas, when they enter the United States and when they leave. The idea is to stop terrorists from entering the country but not impede the flow of legitimate travelers and trade. The massive undertaking will integrate 19 legacy computer systems, provide border-crossing agents with biometric and biographical data on people entering and leaving the United States and offer links between DHS and other agencies such as the State Department. "A lot of people saw us as an underdog," said Eric Stange, Accenture's program manager for U.S. Visit. They might have underestimated the company's ability to craft an effective solution and its past experience on similar projects in other countries, he said. DHS officials said they weighed four factors in picking Accenture: business and technical skills, experience in handling major projects, experience in border systems, and cost. Accenture's team includes AT&T Corp., Datatrac Information Services Inc., Dell Inc., Deloitte Consulting LLP, Raytheon Co., Sandler and Travis Trade Advisory Services Inc., Sprint Corp., SRA International Inc. and Titan Corp.
Accenture also has set a small business goal of 48 percent, Stange said. Accenture's stock rose a modest 3 percent to $25.36 on the day the contract award was announced. Ray Bjorklund, senior vice president of consulting for market research firm Federal Sources Inc., McLean, Va., said a combination of factors contributed to Accenture's win. Accenture probably promised the most innovative approach and had the lowest price, at least when compared to Lockheed Martin. "With Lockheed Martin's tradition, you are going to pay more because they usually want more risk mitigation," he said. Picking CSC would have been politically difficult because of problems the company has had on high-profile contracts such as the IRS Prime Integration and FBI Trilogy, both projects to modernize business systems. "I'm not saying they are a bad company, but awarding it to [CSC] would leave people uneasy about the decision-making," he said. CSC officials declined to comment on DHS' decision to award the contract to Accenture. Lockheed Martin released a statement expressing their disappointment. "Lockheed Martin was seen as the front runner, followed by CSC," Meagher said. The main factor in many people's surprise was that Lockheed Martin and CSC were viewed as having deeper past performance records. But Stange said his company has built border management systems in Ireland, New Zealand and Canada. "These aren't as large, but the pre-entry-exit processes are very similar," Stange said. Accenture also is the prime contractor on the $400 million project to modernize the business systems for the Defense Logistics Agency. "We have the credentials to handle large mission-critical projects," he said. Another issue: The General Accounting Office criticized Accenture and several other companies two years ago for using offshore locations as a tax dodge. But Stange said the fact that Accenture's corporate headquarters are in Hamilton, Bermuda, should not raise eyebrows. The contract was won by Accenture LLP, the U.S. subsidiary of the Bermuda parent company, he said, "and we pay taxes on every dollar we earn in the United States." One of Accenture's biggest challenges moving forward will be managing the pace of the project, Stange said. "The schedule is very aggressive, and there are a number of stakeholders, so we have to make sure we communicate well with them," he said. U.S. Visit is structured as a task order contract, and the first task order is expected within a month, Stange said. Three task orders are in the works, DHS officials said. Accenture bid $72 million to complete the first two of those three task orders, said Jim Williams, DHS' program manager for U.S. Visit. [IMGCAP(2)]The first task, which will run for a year, is to set up a program management team for U.S. Visit. The second is to activate the system at the country's 50 busiest land borders by the end of this year. The third task order is to design methods of sharing information among U.S. Visit systems and institutional users, Williams said. Spending on U.S. Visit will be set by Congress and the administration, and the legislature has ordered GAO to keep close tabs on the program. Undersecretary for Border and Transportation Security Asa Hutchinson said he agreed with GAO's view that U.S. Visit is a risky program. "I would have been frustrated if they had not said it was a risky system," Hutchinson said. "I do not dispute that." Senior Editor Nick Wakeman can be reached at nwakeman@postnewsweektech.com. Government Computer News Senior Editor Wilson Dizard contributed to this story.